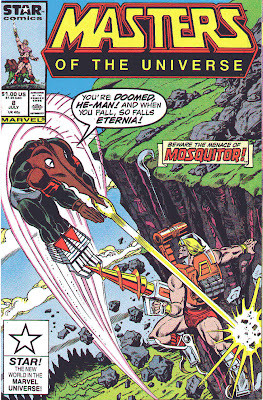 Masters of the Universe #8, “The Getaway,” is by Carlin, Wilson, and Bulanadi. Here, Hordak shows up on Eternia to do…something. Holy swamoli, Carlin’s at it again with a plot that makes no sense whatsoever. Hordak conquers the Royal Palace, takes care of all the Heroic Warriors, and, having achieved near-total victory, wanders off into the mountains, apparently content with stealing a single weapon from Man-At-Arms’ workshop. Fortunately, He-Man has plenty of brand-new toys handy to help him save the day. Carlin doesn’t stop there. Snake Face and Sssqueeze are working for Hordak, and Sssqueeze can breathe under water. Mosquitor can fly. Hordak, the great sorcerer, is inexplicably reduced to walking through the forest after his great victory, for the sole purpose of allowing the protagonists to hear enough exposition to get involved. He-Man’s sword is shooting energy beams again. We’re expected to believe that Man-At-Arms created Buzz Saw Hordak’s buzz saw? How can you even steal a weapon that has to be installed in your chest cavity? The art team is the same as the last few issues, and yet Wilson, who’s penciled all the comics thus far, has really botched He-Man’s sword this time. And his scale issues with He-Man’s transformation continue, only here he’s got the opposite problem: an absurdly tiny He-Man. Lazy. You know, I don’t mind having toys plugged to me as long as it’s done in a remotely coherent way. But this is a horrendous piece of work.